Jacket potatoes sprinkled with cheese, topped with savoury mince and a dollop of sour cream. Lovely. It’s a meal I grew up with and now so are my kids. They love it. 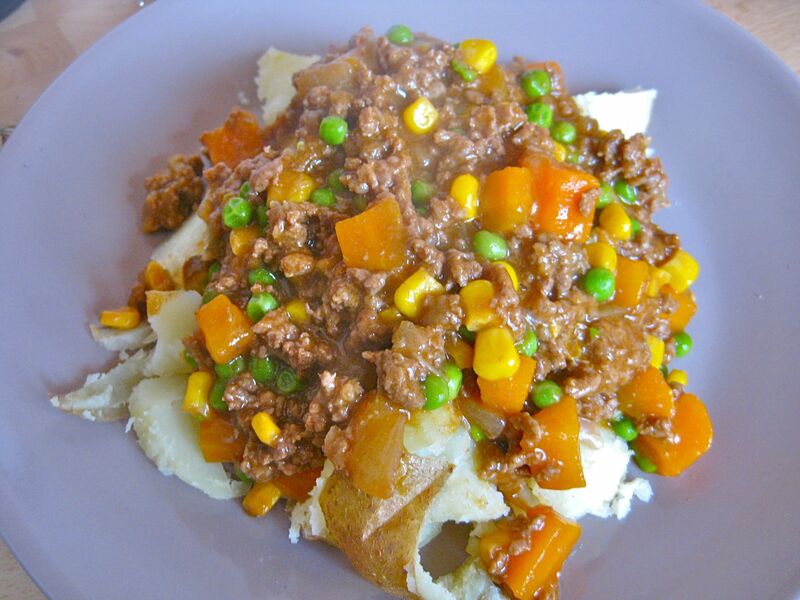 I have always played around with my savoury mince, never knowing what it is exactly that makes it good. I have used herbs, sauces and spices to intensify the flavour but recently discovered that all I needed were three simple sauces to make it super delicious. For the perfectly cooked jacket potato, throw a medium sized potato into a 180C oven for about an hour (no foil, no pricking). When you take it out, poke a hole in the skin and let the steam escape, turning the insides all fluffy. In a saucepan, saute onion and garlic. Brown the mince, then add all the sauces. 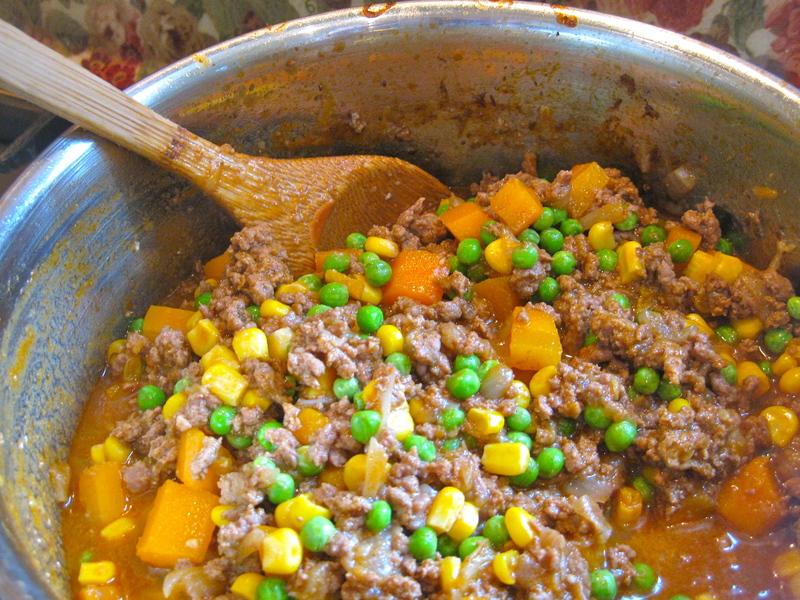 Cover the mixture with water and simmer for as long as you can. When the water has nearly all gone, thicken the meat up with a flour and water paste, while on the heat. Stir quickly to integrate and thicken. This looks perfect. Nice and simple, made with ingredients that we all have in our cupboards already. Thank you. Your recipe meets my taste. Thank you. If you like to get in touch with german recipes from our household you are welcome. Have only just found your blog tonight and am enjoying reading the recipes and about your trips abroad. I am originally from Windsor in Berkshire and know one or two places you’ve mentioned, although now, I’m a dedicated Dorset man…. Your savoury mince recipe looks really good, but can I ask you to take a look at Antonio Carluccio’s book “Italian Feast”. He gives a recipe for Ragu (bolognese to us!!) and it is stunning, although it does require some long cooking time. The ingredients are very simple and easily obtainable, just olive oil, butter, onion, minced beef and pork, white wine, tomatoes, tomato puree and some seasoning. Like I said, simple. It does however, need about 2 hours of low, slow cooking, although I give it 3(!!) but you will end up with a fabulously rich mince sauce, which could be the base for many a dish, as I’ve proved on many occasions. The best I’ve ever tasted. Looking forward to reading more of your older blogs. All the best. Thanks for the tip and thanks for reading! I rather like Carluccio and I love the idea of using beef and pork minces. It probably doesn’t surprise you that I have a ragu recipe up my sleeve, (http://feedingtimeblog.com/2010/03/01/macaroni/) and I do use tinned tomatoes when I make a mince bolognese. I guess I like the mince to taste a little bit less tomato-based for savoury mince purposes, which is where the brown sauces come in to make it more umami. I must agree with you that longer cooker will make any dish taste better and an over-night stay in the fridge will tip over the edge. Perhaps I’ll try this recipe when my in-laws visit from Australia next week!